So we already know that I made the decision to enroll myself in a project to "organize" this year. The decision part was easy. The where-to-start part proved a little harder. So I started with what I always do - A List. My husband is perplexed with my obsession with lists. I have lists everywhere. I even have lists for my lists! He said that having that many lists can't possibly help with organization - it's just one more massive thing to keep track of! Yet somehow, it does help. Sometimes when I have a huge list (as seems to often be the case), it is a bit daunting. But at the same time, I don't have to try to keep all that stuff in my head. Once I write it down, I don't have to worry about trying to remember it anymore. Whether if the task is completed or not, it's one more thing off my mind. Plus, there's something that is just so satisfying about crossing an item off the list. In a world where the "to-do" list never seems to be completed, it's nice to have a visual representation of all the things I have completed. I might get very frustrated, feeling like I never get anything done, if it wasn't for those lovely dark lines, striking through my list! 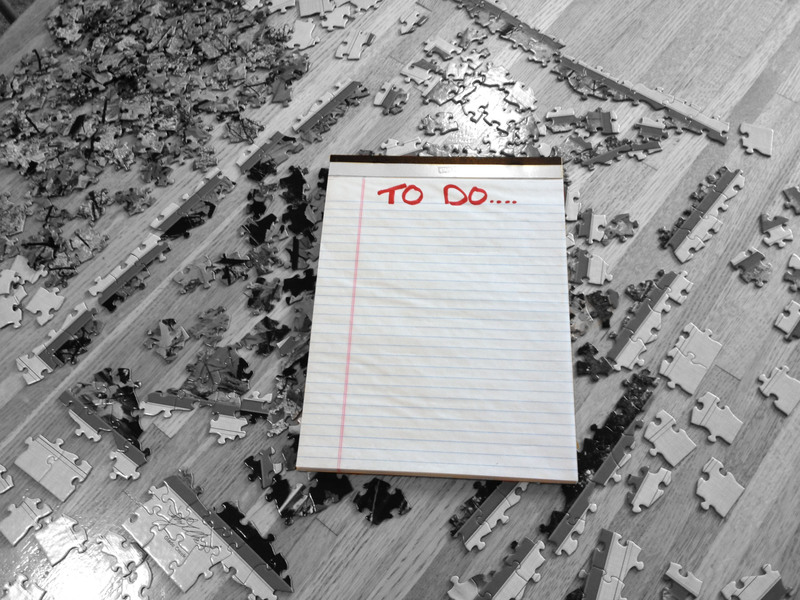 So, when I decided to put my Project: Organize into action, the first thing I naturally did was make a list. I just stream of conscious wrote down everything I wanted to "fix up" - whether if it was a house project, a work project, or even a new exercise routine. In less than 2 minutes, I suddenly had 66 items on my list, and I was still going! Daunting? Yes. How was I realistically going to get all of this done? It's not like I can take a whole year off from work and life to just concentrate on this. (Although, that fantasy was very alluring!) Was this hopeless? Was this project doomed from the start? 2. Get started - Just do it. I would love to hear feedback from my readers during this project. Have you had a similar experience? Was there a time in your life that you had to take a step back and make a difficult decision or re-evaluate things? How did it work out for you? What are your experiences with The Almighty List? Please comment on these blogs with your experiences as well! I know there are many people out there who have needed to re-evaluate, organize, or make certain changes in their lives and I would love to have a section that can take my personal experiences to a more global level and create a community involved in this mission!